Sketch book: Spiral-bound Mead Academie sketch book with 8 1/2″ x 11″ pages. The pages are perforated so you can tear them out neatly. This is useful for me because I do almost all of my outlining, note-taking and planning using Mind Mapping (aka idea mapping), a visual form of writing. Unlined paper is essential for this way of working. The 8 1/2 x 11 size is important so sheets will fit in standard file folders and cabinets — most sketch book paper sizes are too big. 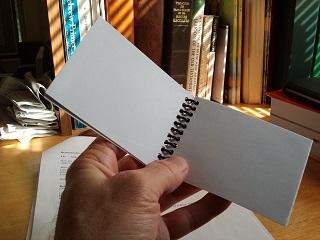 Pocket notebook: Custom-made spiral notebook made with unlined paper and sized to fit in a shirt pocket. Especially critical for jotting down ideas anywhere I go — as you know, ideas can come to you at any time and you need a medium to capture them right away. Again, the unlined paper is important, as I often make these notes in visual format. I have these custom-made at an office supply store such as Office Max or Staples. Shirt pocket pouch: This was custom-made by a designer who works with my wife at Trader Joe’s. Kim originally made it as kind of a joke because I told Virginia I needed a pocket protector to hold all of my writing instruments (I am mercilessly ridiculed by everyone I know for carrying all this stuff in my shirt pocket). The first thing I did when I received the pouch was cut off the front flap, the part that is supposed to protect your pocket. That doesn’t matter much to me. What does matter is having all of my writing instruments in one container that I can quickly and easily take in and out of my shirt pocket. The pouch is made of suede, so it doesn’t fall out of my pocket easily. Pens: I carry three pens in my shirt pocket, plus a small highlighter and a stylus that I can use on my smartphone or tablet for special text-entry tasks. The pens are all very specialized and could be considered individual tools in themselves. The most important is a Coleto five-color gel pen I bought from JetPens. It’s a great piece of technology for someone who likes to take multi-color visual notes. It’s not disposable like the cheap multi-color pens you can buy in office supply stores. When a color runs out, you install a refill, and the refill process is not too difficult. Another pen I carry is a useful Zebra combination mechanical pencil and ballpoint pen with both red and black cartridges. It also has an eraser, which you don’t always get with multipens that have pencil cartridges. The third pen is an 005 extra-fine marker pen. I alternate between the Pigma Micron and the Prismacolor Premier, both of which I like. I use these markers principally for making marginal notes in books and journals — plus any time I need to write something in a very small space. These pens are very legible and don’t bleed. Cargo pants: Just gotta say it. If God hadn’t wanted us to carry a lot of stuff, he wouldn’t have given us cargo pants. Digital audio content: I read a lot, but digital audio (and books on tape before that) has made it possible for me to consume a lot more content, both fiction and non-fiction. Right now, I use an iPod Nano just because it is a reasonably robust and rugged technology. My most important content comes via a monthly subscription to Audible.com, which allows me two audio books a month for a set fee. Over the past year or two, podcasts have become more important to me as content sources. Because I use the iPod, I synch with iTunes, but Audible has its own Audible Manager application, which has improved over the years and synchs with many brands of digital audio players. I listen to audio content when I am driving any significant distance, and this format for content is a tremendous incentive for me to exercise every day. You are currently browsing the Tools for Thinkers blog archives for August, 2013.